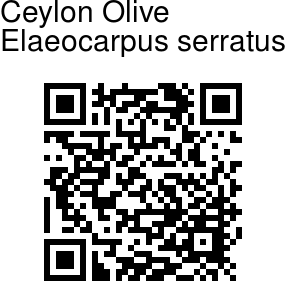 Ceylon Olive is a tree, up to 20 m high, aerial roots on large buttresseses; bark 8-10 mm thick brown, mottled with grey; blaze red. Branchlets, leaf-stalks, flower-cluster-stalks and young leaves are densely velvet-hairy. Leaves are simple, alternate; leaf-stalk 15-40 mm, slender, velvet-hairy, swollen tipped, with 2 minute glands at tip; blade 5-14 x 2-6.2 cm, elliptic-obovate or elliptic ovate, base pointed or wedge-shaped, tip pointed, caudate-tapering or bluntly tapering, margin rounded toothed-sawtoothed, hairless, leathery; lateral nerves 3-8 pairs, pinnate, prominent, intercostae netveined, slender, prominent, domatia glandular. 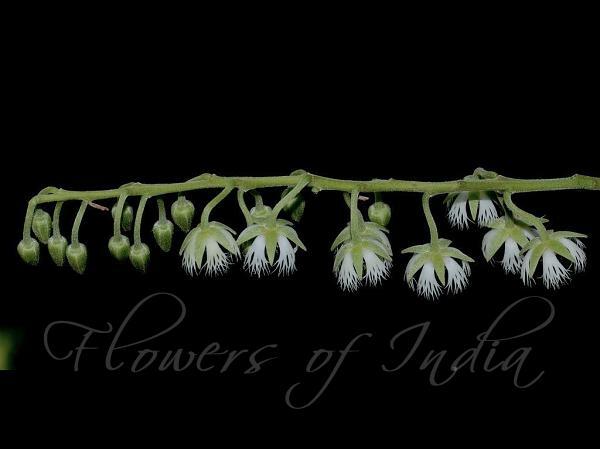 Flowers bisexual, white, in in leaf-axils racemes to 8 cm long; sepals 5, ovate, velvet-hairy on outside, densely glandulose, valvate; petals 5, laciniate, inserted round the base of glandular disc; stamens many, inserted between the glands on the disc; anthers not awned, tipped with hairs; ovary superior, densely woolly, raised on torus, 3-celled, ovules 2 in each cell; style subulate, entire. Fruit a drupe, subspherical, green, style persistent; stone tubercled; seed one. Ceylon Olive is found in Indo-Malesia.